Approximately 19 neighbors showed up to volunteer in Parkwood Park on Saturday, March 19 between 9 a.m. and noon for our 4th official Park Cleanup Day. We started off with a short ceremony for the hollies and the chopping began. Thanks to Karna Candler and her team, the West Ponce entrance is looking better. Steve Elmore will be removing the bricks from the toppled brick wall and saving them in case we ever have a new design for the north Park face which could incorporate these “historical” bricks. Sheri Kennedy’s team pulled ivy, but there is so much ivy in the Park that progress is tedious and nearly indiscernible at this point. The Park Committee is exploring the safety of using a chemical means of removing and controlling the ivy, and is consulting with Invasive Plant Specialist Terry Sutton about his methods. 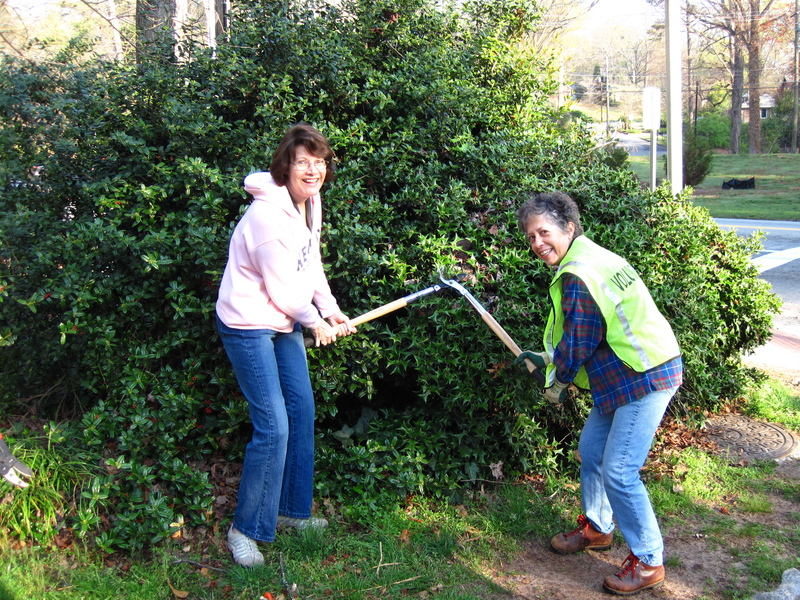 He has done invasive plant removal work for City of Decatur, Deepdene, and Woodlands Garden. At this time it is only a consideration until more research is done. A group of 4 or 5 men on Steve Elmore’s team cleared most of the stream of dams that were clogging the waterway and resulting in bank erosion. The visual difference is quite noticeable, and they used a dam-clearing method that was recommended by Joe Burgess of the Georgia Forestry Commission and Sally Sears and Susan Stainbeck of South Fork Conservancy. There were noticeable “dams” to be found in at least one drainage pipe draining into the creek from the corner of E Parkwood and Ponce. The storm drain there is 75% blocked and prevents effective drainage of storm water runoff from E Parkwood. This matter, among other structural and drainage issues, is being handled by Sheri Kennedy and Dekalb inspector Jim McKinney. Lots of garbage was also removed from the Park and placed in orange bags to be removed by county sanitation. Rebecca Kerimbaev’s team cleared the Park perimeter of some of these bags and then placed Storm Drain Markers on 14 storm drains that empty into the creek. The markers are permanently adhered to the tops of drains and warn people not to dump any kind of waste into drains that flow into the creek. The markers were provided by the DeKalb county Department of Watershed Management. If you own one of the homes in Parkwood that has storm drains in your backyard and you would like one of these markers for your drain, please contact Rebecca Kerimbaev. Rebecca, great recap of the day!! FYI we have a ticket in with Keep DeKalb Beautiful to notify the Sanitation Dept to pick up the yard debris around the park. It is a two week process–or more depending on the number of times I call. The debris will be picked up.